It’s time for a little mac-related rant, for one of the few things that disturb me when using my computer at work. I immediately fell in love with Mac Mail: Lightweight and nimble, but at the same time offering a much more powerful experience than Outlook/Entourage, very much thanks to the speed and ease of use of the search function, which plays in a completely different league than the “Advanced Search” in Outlook 2007. The only problem I have with it is so trivial that I was really surprised to see that it’s been a regularly re-occurring question on forums for several years, namely the little question of fonts. My gut feeling is that a modern mail software should be more or less WYSIWYG. Most of today’s mail programs solve this by encoding the contents of mail using regular HTML tags. Mac Mail uses Rich Text Format instead, but that’s just a technicality – it should do the exact same thing as ThunderBird or Outlook, which is to have some kind of a header containing information for the reader’s rendering software to use font (or font family) x, in size n, etc, so that the reader gets a similar experience as the writer probably intended her to have. In a corporate environment, this is even more important, since PR departments often define a graphical policy for the company to use, so that customers get a homogeneous impression of the company even if they have to deal with different employees. Sorry for the size, but I really want the horribleness to stand out in all it’s gory. The mail was written in Mac Mail, using a font set by me according to company standards: Arial, 12pt. The signature was explicitly set to “Always match my default message font” in Mail Preferences. Upon reception in Outlook 2007, the recipient’s software obviously does not receive any kind of information about what font to use when rendering the email, but instead defaults to Times New Roman. This time the size is right, at 12 pt. I haven’t experimented enough to see if that’s just a coincidence, but judging from the character of the rest of this problem, it probably is. The signature, however, is a different font, namely the font I chose when I created it: Calibri. But the size is wrong. When I created the signature, I wanted it to be size 11; slightly smaller than the other text in my mail. But as stated above, I checked the box to make Mail adjust the font properties of the signature to match the rest of the mail. 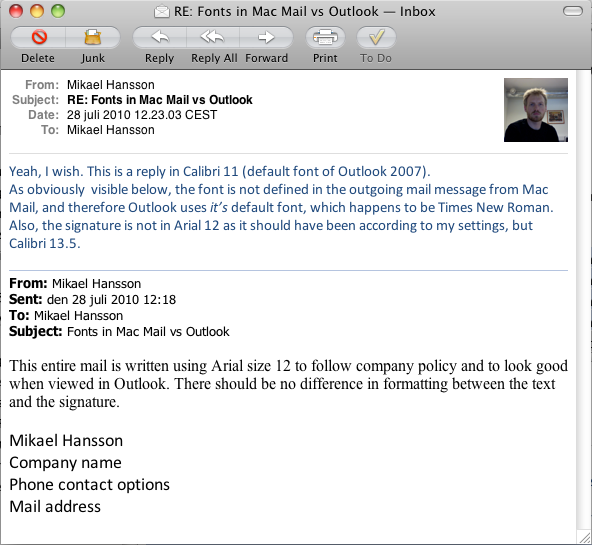 It’s obviously not a general problem with Mac Mail’s ability to handle different fonts, though, since it obviously shows the message exactly as it was received by Outlook, and the replied text is rendered exactly as it was displayed in Outlook when I wrote it. Yes, that’s a completely serious response on a Mac forum, along with a fanboi rant about how it’s really Outlook’s fault that Mac Mail doesn’t define fonts properly when creating the RTF information for the message, and that Microsoft should choose another default font in Word. The problem with this workaround is of course that it’s a lot of time down the drain if you write more than a couple of mails a day. Create a custom signature using the font you want your message to use. Start the signature with an almost empty header, so that you can write your message inside the font definition tags for the signature. I understand this one. Also, it’s not a lot of work. But this is something I might have accepted from an obscure, non-supported, free (as in beer) software package for a Linux based system in 1996. Having the same kind of “solution” for the main communications package bundled with an Apple operating system in 2010? Yeah, right. And by the way, I’m still not sure if the font size is correctly transmitted with the message. This is actually the best solution of them all. Except for the little fact that plain text will be rendered as Courier New by Outlook, and where does that look professional in a corporate environment? Also, 1982 called and wants it’s ASCII table back – it’s needed on another BBS. What’s the next big thing in email? ANSI “graphics”? Don’t get me wrong, these de facto standards were great, but when there is a working way of solving the problem in a way that looks good regardless of the viewing software (yes, a text-only software might strip formatting tags it can’t render), then why oh why not simply fix such a simple thing that does so much (relatively speaking) for the credibility of a system in the corporate world? I really want to continue using Mail. It’s a great program with great features, which does what I want to do as fast as I want it to. I’ve filed a bug report to Apple regarding this problem, as have, seemingly many others. Follow this link to join the movement and file your own report on this bug – Mail is a good program, it just needs some fixing to be usable in a professional environment. With enough people complaining, we can become a bunch of complaining people.